We’d love your help. Let us know what’s wrong with this preview of Encircled by S.E. Clancy. Experience six of the world's most beloved stories in a whole new light! From historical to futuristic, these retellings will take you to an enchanted forest, a cursed castle, and far beyond. Uncover secrets of a forbidden basement, a hypnotic gift, and a mysterious doll. Fall in love with a lifelong friend or brand-new crush. Venture to unknown lands on a quest to save a Experience six of the world's most beloved stories in a whole new light! From historical to futuristic, these retellings will take you to an enchanted forest, a cursed castle, and far beyond. Uncover secrets of a forbidden basement, a hypnotic gift, and a mysterious doll. Fall in love with a lifelong friend or brand-new crush. Venture to unknown lands on a quest to save a prince, a kingdom, or maybe even a planet. With moments of humor, suspense, romance, and adventure, Encircled has something to offer every fan of fairy tales, both classic and reimagined. Published April 16th 2019 by Kydala Publishing, Inc.
To ask other readers questions about Encircled, please sign up. 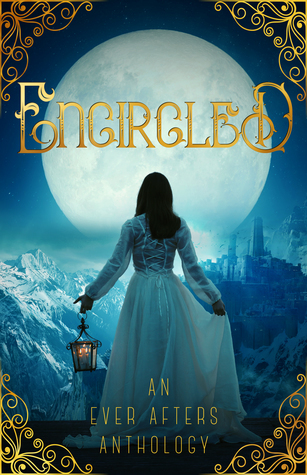 Encircled is a wonderful anthology that brings together six authors' fairytale retellings. Believe me, it's been masterfully done. Upon opening this book you'll find this quote in the Introduction: "You hold in your hands [the authors'] finished product. Encircled is the culmination of nearly two years of writing, editing, dreaming, and hard work. ", to which my only thought was "I'm honored, people!". Thus, I hope the following review (more like, my thoughts on each story) does it justice. Edged Encircled is a wonderful anthology that brings together six authors' fairytale retellings. Believe me, it's been masterfully done. Upon opening this book you'll find this quote in the Introduction: "You hold in your hands [the authors'] finished product. Encircled is the culmination of nearly two years of writing, editing, dreaming, and hard work. ", to which my only thought was "I'm honored, people!". Thus, I hope the following review (more like, my thoughts on each story) does it justice. Edged in Silver (Snow white) - this story starts the anthology with a bang! #ConfessionTime Snow White is not particularly one of my favorite fairytales, yet this retelling hooked me in halfway through its first chapter. The first meeting with Garrick, the Prince of the dryads of the Southern realm, was soooo cute, and it left me with the biggest grin on my face (as well as there might have been a bit of swooning *sigh*). The Songbird's Citadel (The Nightingale) - Loved the world building! I wasn't so familiar with the fairytale, or couldn't remember many details, but the story worked out so well! I certainly fell for West and his deep brown eyes, but I also enjoyed the fact that music and singing is such a central piece to this tale. PS: Lol, I want the interactive mirror with how to apply makeup instructions. The Last Mrs. Bluebeard (Bluebeard) - All I can say is "chilly", and "haunting". I'm not a fan of horror stories (not that this one is a horror one per se), but I'll say that I'm glad I got to read the classic fairytale when I was younger and, thus, knew what was coming. A tasteful retelling. I especially liked getting to know how he got his blue beard. A Spell's End (The Nutcracker and the Mouse King) - I loved it! So cute, so sweet and so full of adventures! A magical retelling that will transport you to different worlds, but which will also give you the sweetest and satisfying ending *romantic sigh* The Nutcracker Prince and Marie are the best! Beyond the Stars, Past the Moons (East of the Sun and West of the Moon) - I loved it! Having read E. Pattou's East a while ago, I certainly enjoyed Ms. Clifford's retelling of this fairytale, which, despite being short, still packs all the necessary elements: both swoony and action scenes, quirky, loyal side characters, intriguing challenges, and the setting? Isn't it just awesome for this story to be set in space? Yup. As Ms. Lucking once said, Milo's and Astrid's story is the perfect conclusion to this anthology (though, seriously, their ending is too just perfect *le happy sigh*). Wrote an in depth review on my blog (http://alliemayauthor.com/2019/04/09/...), but I figured I’d give a bit about each story here. Edged in Silver 3/5 stars—My least favorite of the anthology. The MC didn’t seem to have any choice in what happened, and all the action happened offscreen. The premise was interesting, though. Just seemed an odd choice for the first story. A Heart’s Desire 4/5 stars—Loved the set up, and I found the characters interesting. The backstory was rich and established a gre Wrote an in depth review on my blog (http://alliemayauthor.com/2019/04/09/...), but I figured I’d give a bit about each story here. A Heart’s Desire 4/5 stars—Loved the set up, and I found the characters interesting. The backstory was rich and established a great plot. Isa was my favorite character. The Songbird’s Citadel 5/5 stars—Definitely my favorite from the anthology. Great worldbuilding, relatable characters with amusing banter, and the plot was so creative for a fairy tale retelling. I loved every bit of this. The Last Mrs. Bluebeard 3/5 stars—A fairly straightforward retelling. The writing was clean and the voice was clear. The ending was a little confusing, though. A Spell’s End 4/5 stars—Wished there was more room to explore the worldbuilding of this story. It had a great premise, lots of action, and I enjoyed the writing. Beyond the Stars, Past the Moon 4/5 stars—Another excellent retelling with a great set up, interesting characters, and a creative twist on the original tale. I loved the way the story ended. My second favorite story. I typically expect that one or two stories in an anthology like this won't be to my taste, but I was pleasantly surprised by how much I enjoyed them all! Even the retellings of fairy tales that I'm not a fan of like Snow White and The Nutcracker were fun to read because of the creative spin. The two sci fi stories were naturally my favorites, but I also took a shine to the retelling of Beauty and the Beast, and the twist at the end. Great anthology for fairy tale and speculative fiction fans alik I typically expect that one or two stories in an anthology like this won't be to my taste, but I was pleasantly surprised by how much I enjoyed them all! Even the retellings of fairy tales that I'm not a fan of like Snow White and The Nutcracker were fun to read because of the creative spin. Great anthology for fairy tale and speculative fiction fans alike!